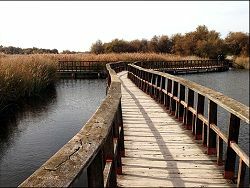 The Tablas de Daimiel National Park , located 140 Km south of Madrid and 30Km north east of Ciudad Real, in Castilla La Mancha, is Spains smallest National Park, extending to 1,900 Ha. 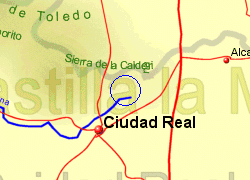 The park is a unique wetland formed by the overflowing of the Guadiana and Cigüela rivers at their confluence. The park also happens to be on the migration route of a large number of waterfowl which will stop to rest in the area or spend the winter there, making this another birdwatchers paradise. 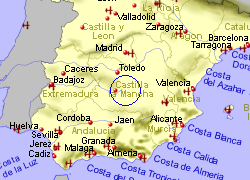 Bird species to be seen include the great crested grebe, common grebe, black-necked grebe, herons, egrets, various Iberian ducks. 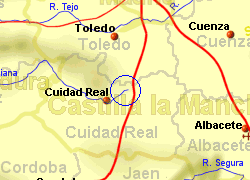 Map of the Tablas de Daimiel National Park area.